The Philadelphia Court of Common Pleas continues to be a national epicenter for product liability litigation. The court’s Complex Litigation Center (CLC) hosts a mass torts program that attracts drug, medical device and asbestos cases from across the county. The continued surge of new lawsuits and judges’ unabated willingness to open the court’s doors to cases from outside the city and state solidifies “The City of Unbrotherly Torts” position on this year’s list of Judicial Hellholes. In addition, both the governor and the legislature have adopted a pro-plaintiff platform signaling to courts around the state that decisions to expand liability are fully supported. 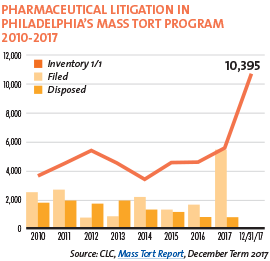 Pharmaceutical litigation in Philadelphia’s mass tort program exploded in 2017. Over 5,000 product liability cases targeting prescriptions drugs were filed that year, compared with about 1,000 to 1,300 filed in 2015 and 2016, respectively. At the end of 2017, the CLC mass tort program hosted over 10,000 cases against pharmaceutical and medical device manufacturers, and about 600 asbestos cases. Over the course of 2017, the number of Risperdal claims pending in the CLC rose 219%, according to court statistics. By June 2018, two thirds of the claims pending in the CLC mass tort program (6,464 of 9,558 cases) targeted the antipsychotic drug Risperdal. There are now over 6,700 Risperdal cases pending. The rise in filings stems from a $70 million verdict to a Tennessee plaintiff in July 2016, a result plaintiffs’ lawyers called a “game-changer.” At the time of the verdict, there were only approximately 2,000 Risperdal cases pending in the CLC, a number that has since tripled. The claims against Johnson & Johnson unit Janssen Pharmaceuticals allege the company failed to adequately warn doctors that the antipsychotic drug, used to help people with conditions such as autism, can cause children to develop gynecomastia, a condition characterized by the abnormal growth of female breast tissue in young men. Bellwether trials began in January of 2015. Throughout the litigation, lawyers for both sides have been locked in a heated battle over which state’s law should apply in the litigation and whether punitive damages are available. Defendants argue that New Jersey law should apply because that is where the company is incorporated and headquartered. New Jersey law does not impose such punishment when the safety and labeling of the product at issue are approved by the FDA, as is the case here. On the other hand, plaintiffs argue that either Pennsylvania law, which does permit punitive damages in such cases, or the law of each individual plaintiff ‘s home state should apply. The Philadelphia Court of Common Pleas had provided some clarity in the litigation after a judge issued a global ruling stating that New Jersey law applied to all Risperdal litigation, effectively taking punitive damages off the table. Unfortunately, in January 2018, a Pennsylvania appellate court muddied the waters when it ruled that the lower court must do a choice-of-law analysis on a case-by-case basis and instructed the Court of Common Pleas to further consider the applicable law. That case involved a plaintiff from Wisconsin, a state that allows punitive damages of up to $200,000 or twice the amount of compensatory damages. Johnson & Johnson argued that New Jersey had the greatest interest in applying its law because that is where the corporate decision making took place, an argument that has ample legal support. The plaintiff argued that Wisconsin had a greater interest in having its law applied because that is where Plaintiff was prescribed and ingested the drug; a point that draws into question why the case was not brought in Wisconsin. The answer is presumably due to the plaintiff-friendly reputation of Philadelphia courts. On remand, Judge Arnold New rejected the defendant’s motion for summary judgment, permitting the punitive damages trial to proceed. The battle over the availability of punitive damages is not the only story line in the Risperdal litigation. Judges also have unfairly restricted defendants’ expert evidence. Earlier this year, Janssen urged an appeals court to reverse a $2.5 million verdict reached after the trial court prevented the company from introducing an article from a well-respected and peer-reviewed medical journal that directly contradicted testimony of the plaintiff ‘s star witness. Finally, there has been litigation around the relevant statute of limitations in these cases. On July 5, 2018, the Pennsylvania Supreme Court agreed to hear an appeal from an intermediate appellate court ruling that found two plaintiffs knew or reasonably should have known about their injuries and the cause by the time the company changed the Risperdal labeling to reflect an increased risk of gynecomastia. The appellate court ruled that the time period to file a lawsuit ended two years from the October 2006 labeling change. If affirmed, this ruling could result in the dismissal of thousands of Risperdal cases pending in Philadelphia. Through June of 2018, there were 1,854 cases targeting the blood thinner Xarelto in the Philadelphia Court of Common Pleas, an increase of 430 cases—or 23% since this time last year. Out-of-state plaintiffs account for 84% of these cases. Despite the plaintiffs’ lawyers’ excessive filings, defendants continue to rack up the victories in court, leaving plaintiffs’ attorneys to desperately search for a winning theory. Plaintiffs originally claimed Bayer and Johnson & Johnson failed to warn of the possibility of excessive bleeding caused by Xarelto. However, the companies successfully pointed out that Xarelto’s label mentions the risk of bleeding more than 70 times. In early 2018, Judge Michael Erdos reversed a $28 million verdict, which included $26 million in punitive damages, issued by a Philadelphia jury to an Indiana plaintiff. Judge Erdos sanctioned two of the plaintiffs’ lawyers for “improper photos and social media posts connected to the trial.” The lawyers took photos in the courtroom while the trial was in progress. One of the lawyers used the hashtag “#KillinNazis.” Bayer is a German company. A few months later, a Philadelphia jury handed down yet another verdict for the defense, finding that the company had adequately warned consumers about the dangers of severe bleeding. For the trial bar, hope springs eternal, as lawyers continue to file Xarelto cases in the CLC, despite not having a viable theory of liability. This never-ending cycle must be stopped, and it is up to the Philadelphia courts to rid themselves of their plaintiff-friendly reputation and put an end to the excessive filings. The CLC also hosts litigation alleging that pelvic mesh implants, which are widely used to address stress urinary incontinence in women, are improperly designed despite FDA approval. Six cases that Ethicon has faced in Philadelphia have led to more than $105 million in combined damages, exclusive of the amounts paid to settle cases. In the seventh of these cases, a hung jury could not decide whether the design of the mesh contributed to the plaintiff ‘s injuries, leading the judge to declare a mistrial on September 24, 2018. Ninety pelvic mesh cases were pending in the CLC as of November 1, 2018. Bayer is involved in another mass tort action in Philadelphia and is fighting to keep the litigation in the proper federal court and out of the Court of Common Pleas. Fifteen plaintiffs sued Bayer over the safety of a birth control device, Essure, and are appealing the removal of their cases to federal court, with hopes of having them sent back to the Philadelphia Court of Common Pleas. Plaintiffs contend the suits belong in state court because the parties are not from different states and the lawsuits only raise claims based on state law. As defendants point out, the claims are “by definition” based on federal law because they assert that Bayer failed to comply with FDA requirements. Plaintiffs recognize that if they are unsuccessful in their appeal, it could significantly narrow the Essure litigation because the federal court has already ruled that federal regulations do not permit many of the claims. In addition to the excessive pharmaceutical mass tort litigation, Philadelphia’s Complex Litigation Center also attracts asbestos litigation from all across the country. Philadelphia ranked fourth nationwide for asbestos claims in 2017 with 263 new filings—an overall increase of 6.5% from the previous year. Pennsylvania is second in the nation for mesothelioma filings, topped only by Judicial Hellhole Madison County, Illinois. Philadelphia saw a 32% increase in these lawsuits in 2017. Four of the top 10 asbestos plaintiffs’ firms have connections to either Philadelphia or Pennsylvania at large. And asbestos litigation constitutes the third highest number of pending lawsuits in the Philadelphia Complex Litigation Center at 561 as of November 1, 2018, behind only Risperdal and Xarelto claims. One bit of welcomed news – companies are starting to fight back against the rampant fraud in the asbestos litigation. 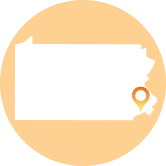 In May 2017, John Crane Inc. (JCI) filed a RICO claim against the Shein Law firm and attorney Benjamin P. Shein in the U.S. District Court for the Eastern District of Pennsylvania. Shein Law markets itself as the “Philadelphia asbestos lawyers.” The lawsuit alleges the lawyers “devised and implemented a scheme to defraud [asbestos defendants], and to obstruct justice” by “fabricating false asbestos ‘exposure histories’ for their clients … and systematically conceal[ing] evidence of their clients’ exposure to other sources of asbestos.” The lawsuit also alleges the lawyers explicitly denied their clients were exposed to other sources of asbestos during litigation but, when the lawsuits ended, filed claims for additional compensation from asbestos bankruptcy trusts, telling different stories. The Pennsylvania case was stayed pending appeal of a similar RICO case JCI brought in a federal court in its home state, Illinois. After the Seventh Circuit ruled the case could not proceed in Illinois in June 2018, the federal court in Pennsylvania reactivated the case. While the case settled soon thereafter, it has shined a much-needed light on the widespread fraud in the state’s asbestos litigation. Philadelphia is a hotbed of litigation tourism; currently 84% of plaintiffs with claims against pharmaceutical makers in the Philadelphia Court of Common Pleas are from out-of-state. These numbers are baffling in light of the U.S. Supreme Court’s decision in Bristol-Myers Squibb Co. v. Superior Court of California, which held that a state cannot exercise personal jurisdiction over claims brought by nonresidents against a nonresident company where the plaintiffs did not purchase, ingest, or suffer injury from the product in that state. While widely considered to be a “game changer” for the defense bar, the decision seems to have fallen on deaf ears in Pennsylvania. The Philadelphia Court of Common Pleas is a magnet for mass tort claims from all over the country, and judges have allowed forum-shopping to continue in other types of litigation as well. In several instances, the Philadelphia Court of Common Pleas has refused to dismiss cases brought by railroad workers who worked, lived and allege injuries that developed outside Pennsylvania. These plaintiffs hail from states such as Maryland, New York, Ohio and South Carolina. The witnesses, including the plaintiffs’ treating physicians, and evidence in the case are all located in states other than Pennsylvania. Businesses hauled into the Philadelphia court file “forum non conveniens” motions asking the court to dismiss cases with no connection to the area, so they can be refiled where they belong. But the Philadelphia Court of Common Pleas repeatedly denies these motions. An appellate court intervened in one such case in July 2018. In Hovatter v. CSX Transportation, Inc., the court ruled that the Court of Common Pleas should have dismissed two complaints against the railroad and directed that the cases be refiled in “more appropriate courts.” One case was brought by a lifelong Maryland resident who was injured, received medical treatment, and whose witnesses lived in Maryland. The other was filed on behalf of a Kentucky resident who alleged cumulative injuries during his work in Kentucky, Ohio, and Indiana, and received medical treatment in Kentucky and Ohio. Neither case against the railroad, which is incorporated in Virginia and based in Florida, had any connection to Pennsylvania. A preliminary version of the opinion recognized that “courts in Philadelphia County are extremely congested” and have become “a magnet for tort suits” that have no connection to Pennsylvania. In another recent case, the Philadelphia Court of Common Pleas permitted a Chester Heights mayoral candidate to sue for defamation in Philadelphia even though she was a resident of Delaware County and the information was aimed at Delaware County residents. The lawsuit alleged the candidate was the victim of a smear campaign and that the defamatory statements were available to Philadelphia residents online. In his opinion, Judge New stressed that his job as a judge is to apply the law, rather than “make new law” and urged the Superior Court to reevaluate the venue rules related to defamation; arguing the law needs to reflect the advances in modern communication technology. The purpose of a defamation action is to restore a person’s name in their community, and under the plaintiff ‘s theory that was applied by Judge New, venue would be proper in any county because a person could access the information any- where. Judge New implored the Superior Court to reevaluate the law and prevent clear forum shopping by plaintiffs. While Philadelphia may be a “Judicial Hellhole” because of the expansive liability, mass torts program, and open- door to lawsuits filed by people with no connection to the area; it does not help that Governor Tom Wolf (D) appears to be strongly aligned with the trial bar. Last year, the Philadelphia Inquirer uncovered a scam run by one of the city’s largest workers’ compensation law firms that just so happened to be donating money to the Governor right before he had an opportunity to veto legislation that would have put an end to it. In the scam to rip off injured workers and insurance companies, plaintiffs’ lawyers from Pond Lehocky would refer injured clients to doctors who would send those same clients to a preferred pharmacy. That may appear like legal cross promotion, until you learn that the lawyers and doctors also owned the pharmacy and would prescribe unnecessary medications for exorbitant costs, including $1,900 for a tube of lidocaine (retail price $14) and $1,600 for a 5-ounce bottle of anti-inflammatory topical solution (retail price $60-$70), which they would then bill to the insurance carrier. In order to get approved to open the pharmacy, the application claimed there were no doctors with proprietary interests in the pharmacy, a claim now known to be false. Twice now the legislature has tried to prevent similar improprieties from occurring in the future through the passage of Senate Bill 936. The bill would limit workers’ compensation medication to an evidence-based list of approved medications to regulate the “type, dosage, and duration of the prescriptions.” In addition to preventing the abuse perpetuated by Pond Lehocky, S.B. 936 would help address the devastating opioid crisis in the state. According to the Workers’ Compensation Research Institute, Pennsylvania has the second highest amount of opioids prescribed per injured worker and the second highest number of opioid pills per prescription per claim. It sounds like a common sense solution to two pressing issues, so why did Governor Tom Wolf veto the law in 2018? He argues the bill would not actually address opioid abuse because it would make physicians prescribe less costly drugs, not less drugs overall. His argument falls short however, because if you regulate the “type, dosage, and duration of the prescriptions,” then you can certainly stop overprescribing by taking a patient off of the drug when they are healed, or regulate the dosage so they do not become addicted in the first place. There may be another explanation for why the Governor would want to kill this bill. In the second half of 2017, Governor Wolf received $1.1 million in campaign contributions from Fairness PA, a political action committee funded by the very doctors and lawyers involved in the insurance fraud scheme. Business leaders and groups from across Pennsylvania joined together to call on Governor Wolf to return the money, and stand up for justice. Governor Wolf was reelected in November 2018, so the prospects of enacting this legislation in the near future are grim. While it was encouraging to see the legislature come together to pass S.B. 936, even though the Governor Wolf vetoed it, the failure to pass H.B. 1037 in the House was a major disappointment for civil justice advocates. The bill would have protected access to nursing home care by limiting punitive damages to 250% of the total compensatory damages. As it stands, nursing care facilities face a constant risk of being shut down by exorbitant punitive damages awards, a risk that leads many of them to settle all potential claims.